Clock generator generating 10MHz, 5MHz, 1MHz, 100 KHz & 100 Hz. 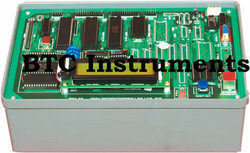 Our VLSI Trainer is offered with Piggy Bag Modules compatible of XILINX 9572 CPLD , 95108 CPLD, SPARTAN XC3S50 FPGA and XC3S400 FPGA, 16 Toggle Input Switch and 16 output with LED indication. These are offered with On board 4 Digit Seven Segment display, 16x1 LCD and 4x4 Matrix Keyboard, On-board ISP Programmer for Piggy Bag Modules, Clock generator generating 10MHz, 5MHz, 1MHz, and 100 KHz & 100 Hz and with an In-Built Power Supply of 5V/1.5A, ±12V/250mA. 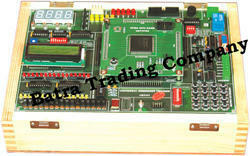 Onboard 4 Digit Seven Segment display, PS/2 port, VGA port, RS-232 port.